Myrtle Beach's online guideis for locals and the millions of visitors to the Grand Strand who flock to the coast every year to enjoy the sand, surf, our many golf courses, oceanfront resorts, and the warm southern climate. 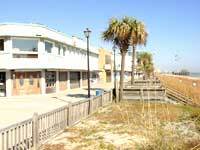 The Grand Strand also has a wonderful variety of excellent restaurants, world-class entertainment venues, shopping centers and factory outlets, as well as lots of fun things to do with the kids. There are quite a few amusement parks and theme parks that offer rides, thrills, and spills for both children and the young at heart. This area has also become a top golf vacation spot -- now boasting over 100 golf courses, and known world-wide for affordable discount golf vacations. We're here to help you find the information you need, whether you're a local and want to keep up with the area's constant changing landscarpe, or you're planning to visit and want to have the best vacation while finding the best deals for your next trip. For those of you thinking about moving here, Money Magazine listed our area in the Top 20 of America's Best Places To Retire, which is probably why it's the second fastest growing metropolitan area in projected annual population and employment growth. A popular vacation destination on the US east coast, Myrtle Beach SC is also a growing residential area with an increasing population of year-round residents. Whether you're planning your next vacation to Myrtle Beach or thinking about relocating to this area and looking for a job, or are already one of the many locals who live here, this comprehensive Myrtle Beach web guide is here to help with online information that's useful for learning more about the local area. If you're coming for vacation, compare offerings at the vast number of hotels in Myrtle Beach, and find discounts for booking your reservations on the web. We've included hundreds of exterior and interior hotel photos, as well as location of the hotels. Numerous discounts and specials are offered via secure online booking or by toll-free phone reservations. If you're looking for a little more luxury and a bit more pampering, check out the selection of new condos, including luxury oceanfront resorts in our area. 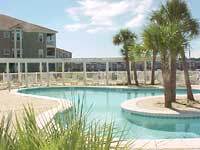 Keep in mind that condos and vacation rentals generally require a longer reservation than hotels, motels, and inns. 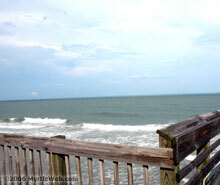 Most visitors drive to the Grand Strand for their vacations. However, there is an increasing percentage who are flying to the area. If you're thinking about traveling by air on your next vacation, take a look at the local airport, where you can find discounted flights, rental cars at the airport, oceanfront hotels nearby, rates, information and availability. Every year a growing number of couples make the decision to get married here. Find all the information you need in our wedding section for a perfect ceremony, reception, and honeymoon here. This isn't the same Myrtle Beach that your parents or your grandparents remember -- it isn't even the same place from a few years ago. The landscape has changed, and is continually changing, with new high-rises and mega-entertainment complexes and multi-million-dollar mixed-used redevelopments. The Pavilion may be gone, but on the horizon is Hard Rock Park, the first rock-n-roll theme park in the world; The Market Common, the multi-million-dollar mixed-used redevelopment of the former airforce base in south Myrtle Beach; and the as-yet-to-be-unveiled projects at the former sites of the Pavilion and Myrtle Square Mall, both prime locations on the Grand Strand. There's a wild ride of changes ahead on the Grand Strand for locals and visitors, that's for sure. Three things most people surfing the net look for are local photos, streaming videos and live web cams of the beach, Intracoastal Waterway, our golf courses, and local traffic jams. We've also found that visitors and locals alike surf Myrtle Beach online information to find current events, especially during the peak season when there's lots of annual festivals, parades, and celebrations. Copyright ©1999-2010. All rights reserved. No reproduction permitted without written authorization.